Shogi is recognized as a CLASSIC Chess variant, distinguished for its immense popularity and rich history. The highest level of recognition, only three games are rated as Classic: Chess, Xiangqi (Chinese Chess), and Shogi (Japanese Chess). Shogi is the Japanese cousin of Chess. Very similar to it in some respects, it differs from Chess mainly by allowing players to keep captured pieces and replay them as their own. Although it shares with Chess the same object, the same general rules, and some of the same pieces, this one difference makes the experience of playing Shogi quite different from the experience of playing Chess. It allows players who are behind to more easily get ahead, and it can keep the outcome of the game more uncertain until the very end. Compare this to Chess, where the difference of a single Pawn can decide the outcome of the game between equally skilled players. This difference from Chess helps keep the game interesting and exciting until the end. The similarites between Chess and Shogi suggest a common origin, and it is commonly held that their common origin was a game called Chaturanga, which arose in India in approximately the 7th century AD. From there Chaturanga migrated westward, eastward and northward, mutating along the way. The westward migration led to Shatranj in Arabia and Orthodox Chess in Europe. The eastward migration likely crossed the Bay of Bengal to Southeast Asia, leading to Makruk in Siam (Thailand) and Sittuyin in Burma (Myanmar). The northward migration spread to China, where it became Xiangqi, and turned east to Korea, where it became Janggi. Shogi shows signs of influence from the regional variants in both southeast Asia and east Asia, and its origin may be syncretic. Notably, Japan was home to many variants, and one that was originally called 'Small Shogi' eventually won out over the larger variants and became known simply as 'Shogi'. It is certain that Shogi in its present form was played in Japan as early as the 16th century. Shogi is played on a 9x9 board. Each player begins with one King, one Rook, one Bishop, two Gold Generals, two Silver Generals, two Knights, two Lances and nine Pawns. As shown on the left, Shogi is traditionally played on an uncheckered board, and four black dots delineate the promotion zones (those squares lying on the last three ranks). Traditional Shogi pieces have the piece names written on them in Kanji (Japanese writing using Chinese characters), and because pieces may change sides, the side a piece belongs to is determined by orientation, not by color. As shown on the right, Shogi may be played on a checkered board with pieces that use pictures instead of Kanji. The setup shown on the right is designed to better show the similarities between Shogi and Chess. Even using these more western pieces, Shogi is best played with wedge-shaped pieces whose orientation determines which side they belong to. Trying to play Shogi with figurine pieces would be impractical. 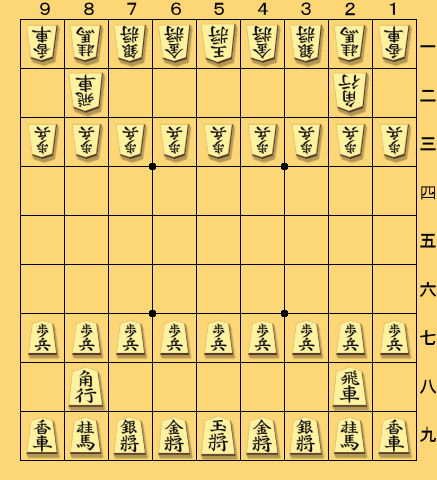 Shogi begins in the position shown below in either of the two diagrams. From left to right, each player's first rank has a Lance, a Knight, a Silver General, a Gold General, a King, a Gold General, a Silver General, a Knight, and a Lance. 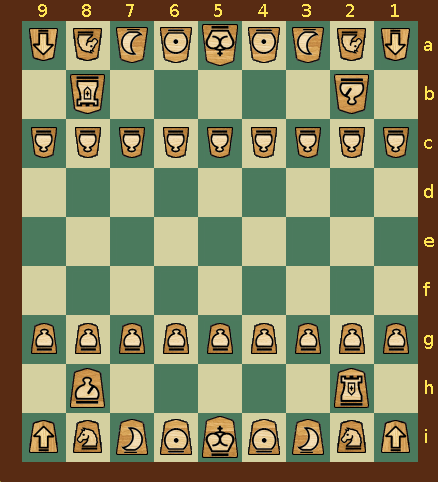 In the second rank, each player has a Bishop in front of the left Knight and a Rook in front of the right Knight. Since the game has rotational symmetry, the Bishops begin in opposite corners, and the Rooks begin in opposite corners. Each player's third rank is filled by Pawns. Checkered board, Chess Motif pieces, and international notation. Shogi is normally played with wedge-shaped pentagonal pieces made of wood or plastic. With a couple exceptions, each physical piece represents a starting piece on one side, and it represents a promoted piece on its other side. This makes the promotion or demotion of a piece as easy as flipping it over. A piece may promote when it moves to, from, or within the three ranks on the opponent's side. Promotion is optional except when the move would otherwise leave the piece without any further legal moves. Promoted pieces are sometimes colored red, but this practice is not universal. Pieces may be represented by their full Kanji names, as half Kanji, which uses only one character for each piece, with pictures, with letters, or with movement diagrams. Pieces with movement diagrams are helpful only for beginners, and they are inessential with computer programs that will show you where pieces can move, as some do. Once you know how the pieces move, it becomes more important to be able to quickly recognize the pieces, and that can be made more difficult with movement diagram pieces, which use similar designs for all the pieces. Kanji pieces are more easily recognized than diagrammatic pieces, and the best alternative to Kanji for westerners would be pieces with familiar, easily recognizable pictures. 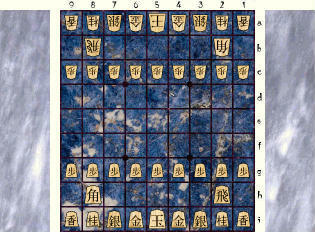 As the pieces are described below, they will be illustrated in full Kanji, in half Kanji, and in the Chess Motif style. To better help you recognize the pieces during play, descriptions of piece movement are followed by notes on the Kanji characters and the symbols used by the Chess Motif set besides Chess piece images. Individual characters and symbols are linked to external pages with further details about them. Individual piece names are linked to Piececlopedia pages with further details and movement diagrams. The King moves as the King in Chess, one space in any orthogonal or diagonal direction. Like the King in Chess, it may not move into check. Unlike the King in Chess, it may not castle. In Japanese, Black's King is called a 玉將, which is transliterated as gyokushō and means "jeweled general", and White's King is called a 王將, which is transliterated as ōshō and means "king general." The 將 used in each name means general. It is also used in the game's name, in the names of the Gold and Silver Generals, and for one of the Generals in Xiangqi. The 王 used for White's King means king, and the 玉 used for Black's King means jewel or jeweled. Since the character for "general" is used in the names of three pieces, the half-Kanji piece uses the characters for "king" and "jeweled." These resemble each other, but the slight difference between them helps distinguish the two sides from each other. The Rook moves as the Rook in Chess, any number of empty spaces along a file or rank, either landing on an empty space or capturing the first enemy piece in its path. It may never leap over other pieces. Unlike the Rook in Chess, it may not castle. The Rook is called a 飛車 in Japanese. This means flying chariot and is transliterated as hisha. The 車 used in the name of this piece means chariot. This same character is used in the name for the Lance and for the name of the Chariot in Xiangqi. Since it is also used for the Lance, the other character, the 飛, is used for the half-Kanji piece. This character means flying, and it is used in the Japanese words for airplane and aviation. The Rook promotes to a Dragon King, which may move as a Rook or one space diagonally. Dragon King is a direct translation of the Japanese name 龍王, which is transliterated as ryūō. The 龍 character means dragon, and you should already know the 王 from its use in the name for White's King. Since the character for king is already used for the half-Kanji piece for White's King, the character for dragon is used in the half-Kanji for this piece. It sometimes also appears as 竜, which looks more like the pictograph of a dragon. The Bishop moves as the Bishop in Chess, any number of empty spaces along a diagonal line, either landing on an empty space or capturing the first enemy piece in its path. It may never leap over other pieces. The Bishop is called a 角行 in Japanese, which is transliterated as kakugyō and means angle-goer. The 角 means angle, and the 行 character means going or goer. Neither character is used in the name for any other piece, and the half-Kanji uses the first character, the one for angle. In terms of meaning, this is the character that better distinguishes the piece, since every piece can go somewhere. The Bishop promotes to a Dragon Horse, which may move as a Bishop or one space orthogonally. Dragon Horse is a direct translation of the Japanese name, 龍馬, which is transliterated as ryūma. You should already know the 龍 character from Dragon King. The 馬 character means horse, and it is also used in the Japanese name for the Knight and for the horse in Xiangqi. The character shown on the illustrated piece looks different. This variation of the character has been used for Green's horses in Janggi: Korean Chess. Since the character for dragon has already been used in the half-Kanji for Dragon King, the character for horse is used in the half-Kanji for Dragon Horse. The Gold General may move one square vertically, horizontally, or diagonally forward. (In all directions except diagonally backward). Gold General is the direct translation of the Japanese name 金將, transliterated as kinshō. The 金 character means gold, and it is used for the half-Kanji piece because the character for general is shared with other pieces. In the Chess Motif set, it is represented by ☉, the astrological symbol for the sun that depicts the sun as a dotted circle and is also used in alchemy for gold. The Silver General may move one square diagonally, or straight forward. (In all directions except horizontally or straight backward.) It has the same powers of movement as the Elephant has in the southeast Asian games of Makruk and Sittuyin. Silver General is the direct translation of the Japanese name 銀將, which is transliterated as ginshō. The 銀 character means silver, and it is used for the half-Kanji piece, because the character for general is shared with other pieces. In the Chess Motif set, it is represented by , the crescent moon symbol from astrology that is also used in alchemy as a symbol for silver. The promoted Silver General moves as a Gold General. In Japanese, this is called 成銀, which means promoted silver and is transliterated as narigin. The 成 means promoted, and the other character is the one for silver. The character on both the Kanji and half-Kanji pieces is presumably a cursive variation of the character for gold. The Knight has the two forward-most moves of the Chess Knight, always leaping to a space two ranks ahead and one file to the side. For example, a black Knight on 5d may go to 6b or to 4b. It may leap over occupied squares. The Knight is known in Japanese as 桂馬, which is transliterated as keima and may be loosely translated as laureled horse. The 桂 refers to the katsura tree, an ornamental tree native to Japan and China. The English word that might best capture the significance behind this word is laureled. This is corroborated by the same character being used in 月桂, the Japanese word for bay laurel. The 馬 means horse, and it is used for the horse in Xiangqi and in the Dragon Horse piece. Since that piece already uses this character for its half-Kanji piece, the half-Kanji for this piece uses the katsura character. The promoted Knight moves as a Gold General. This piece is known in Japanese as 成桂, which is transliterated as narikei and means promoted katsura. The character on the illustrated Kanji and half-Kanji pieces is presumably a cursive variation of the character for gold. The Lance moves as a Rook but only forward in the same file, never sideways or backward. The Lance is known in Japanese as 香車, which is transliterated as kyōsha and means incense chariot. We already know from the Rook that 車 means chariot. The 香 character means incense. Since the chariot character is used for both of these pieces, the incense character is used to represent this piece in the half-Kanji. Instead of being a translation, the name of lance captures the forward-only nature of this piece's movement. The Chess Motif set represents this piece with an arrow in the shape of a one-way sign. The promoted Lance moves as a Gold General. This piece is known in Japanese as 成香, which is transliterated as narikyō and means promoted incense. The character on the illustrated Kanji and half-Kanji pieces is presumably a cursive variation of the gold character. The Pawn moves one square straight forward. Shogi Pawns capture in the same manner as they move -- as do all Shogi pieces. Shogi shares this characteristic with the east Asian variants Xiangqi and Janggi, in which Pawns capture as they move instead of diagonally. The Pawn is known in Japanese as 歩兵, which is transliterated as fuhyō and means foot soldier or infantry. The 兵 means soldier, and it is also used in Xiangqi for Red's Pawns. The 歩 character means walking. Neither character is used for another piece, and the half-Kanji piece uses the character for walking. Although it might make sense to use the same character as Chinese Chess, the half-Kanji pieces are consistent in never using the same character as the corresponding piece in Xiangqi. Whether this is by design or just coincidence is unknown. The promoted Pawn moves as a Gold General. The promoted Pawn is called a と金, which is transliterated as tokin. The second character is that for gold. The と character, which is used on the Kanji and half-Kanji pieces, may mean when, and, or with. It is common for English speakers to call this piece by its transliterated name. The object of the game is to checkmate the enemy King. Perpetual check is forbidden. The player initiating the check must break it off. Except for a King or Gold General, any starting piece that moves to, from or within the promotion zone (the last 3 ranks) may promote. With physical pieces, a promotion is normally handled by flipping the piece over to display the symbol on its bottom side. Promotion is optional unless the piece would have no further legal moves from its new position. So, when a Pawn or Lance moves to the last rank, or a Knight moves to one of the last two ranks, promotion is mandatory. Pieces dropped into the promotion zone (the last 3 ranks) may not promote until making at least one move. (See below). Only one piece may be dropped on the board per turn, and this must be done instead of moving a piece on the board. A captured piece may be dropped only on an empty space. A Pawn may not be dropped onto a file containing another non-promoted Pawn belonging to the same player. No piece may be dropped on a square from which it is impossible to move. So, a Pawn or Lance may not be dropped on the last rank, and a Knight may not be dropped on either of the last two ranks. A checkmate may not be performed by the drop of a Pawn. A King may be checked by dropping a Pawn, but only if the drop does not result in an immediate checkmate. Various Shogi videos are available on YouTube. HIDETCHI has made numerous videos on Shogi. His videos cover the rules of Shogi, Shogi strategy, famous Shogi games, and famous Shogi mate problems. Hirohigo has made several videos on Shogi proverbs. One of the best ways to learn Shogi is to play against a computer program that will show you where the pieces can move. The following three are Windows programs. If you don't have Windows, you may be able to run them with a Windows API, such as Wine on Linux. For absolute beginners, Steve Evan's Shogi Variants is a good choice. It describes and shows how the pieces move, and it plays very poorly. It also covers various historical Shogi variants, both large and small, from Japan. Once you can beat Shogi Variants, you'll need a stronger opponent. Zillions of Games, a commercial program capable of playing many games and puzzles, can play Shogi, and its interface is excellent for anyone trying to learn a game. Instead of being a native Shogi application, it plays Shogi by interpreting a script that describes the rules, known as a Zillions Rules File or ZRF. The Shogi ZRF that comes with it plays very poorly, because it values unpromoted pieces more than promoted pieces, and it handles drops inefficiently. Because of these defects, both Steve Evans and Fergus Duniho wrote ZRFs that play Shogi better, and they combined their efforts into a single script: fdshogi.zip. By combining Evans' ideas about fixing piece values with Duniho's ideas for handling drops more efficiently, the new script plays better and can easily beat Evans' Shogi Variants program while playing at its fastest speed, something the Shogi ZRF that comes with the program cannot do. It also provides new Shogi graphics, including the Chess Motif set seen on this page, taking advantage of ZoG's full graphics customizability. But compared with a dedicated Shogi engine, it is still rather weak. This is good for beginners, but it's not strong enough for more advanced players. If you need an even stronger opponent, Bernard C. Maerz's BCMGames is a great choice. This free program includes the SPEAR Shogi engine, and it can be used with any UCI-compatible Shogi engine, which should give you as strong an opponent as you will need. It also has fully customizable graphics and comes with many different piece and board images, including those used to make the diagrams on this page. On our own site, you can play Shogi, as well as many other Chess variants, against other people online, using Game Courier. It will enforce the rules of Shogi, display legal moves, automate the transfer of captured pieces to offboard locations, and spot win/loss/draw conditions. It will also let you choose from a variety of graphics, including both checkered and uncheckered boards, and both pictographic and Japanese piece sets, including all the piece sets displayed on this page and more. Pictures of a shogi set. More photo's of shogi set. Photo's of other shogi set. By Jean-Luc Muraro. Photos of Homemade Symbolic Shogi Pieces. By Fergus Duniho and David Howe. We don't have translators working around the clock to keep up with the latest English version of this page, but we do have some translations of earlier versions. 將棋(日本)(Shogi) - Chinese translation by Ri S. Huang. The Kanji Shogi pieces are by Koma-Shokunin 1, and they are used under a Creative Commons Attribution-NonCommercial license. The full Kanji set is called Kinki Regular, and the abbreviated Kanji set is called Kinki Abbreviated (Inscribed). The Chess Motif pieces were made by Fergus Duniho, using Armando Marroquin's Chess Motif font for the Chess piece images. The Lance and Generals were drawn by Fergus Duniho. The symbols for the Generals were borrowed from alchemy, which used astrological symbols to represent various metals. The board images were made by Fergus Duniho using BCMShogi, because this Shogi program has fully customizable graphics and comes with some very nice Kanji graphics for Shogi, namely the pieces designed by Koma-Shokunin 1, already credited above. This page was originally written by Hans Bodlaender. In 2002, it was edited and updated by John William Brown. In 2010, it was rewritten and redesigned by Fergus Duniho. David Howe has also made updates to this page. Thanks also to Ivan A Derzhanski for corrections to the linguistic information on the word Shogi. Thanks also to Shinsuke Mori for pointing out that the graphics for promoted Silver General and promoted Knight had been switched.